Philly Teacher: Is ISTE Still Relevant for Young Educators? As many of you may know, I was given the honor of being named this year, along with 3 others (Chris Craft, Lisa Sjogren, Adam Bellow), an ISTE Emerging Leader. My new colleague, Julie LaChance was awarded ISTE's Outstanding Young Educator Award. I was excited to meet the awardees as it was certain that we had something in common and that these were people with whom I should be collaborating. It turned out that many of us ran in the same circles and that we indeed share a lot of the same goals and motivations. Before reaching Denver, I had spent a few days with some colleagues vacationing in the calm before the ISTE storm. As the 'baby' of the group, I found that my outlook, goals and passions did not differ from my elders. One interesting fact I learned was that it seems that ISTE's smallest membership is with educators under 35. A colleague made the observation that perhaps ISTE is irrelevant for younger teachers, who find it commonplace for technology to be integrated into teaching and learning. That said, there was definitely a small number of attendees at the Young Educators' Network event. I have two theories as to why this is. For one, perhaps we don't want to be labeled. Being a newish, younger teacher can often hold a stigma. Younger teachers are seen as novices, even if we don't feel like one. Secondly, yes, we're young, but one aspect of being a teacher is that your colleagues are of various ages. As such, we're used to hanging with colleagues who are of a different age or generation. I still think that ISTE is relevant for young educators, and I feel that building a network of young educators is important. The 4 other award winners are people for whom I have a lot of respect. They are accomplished and make a huge impact in the field. Were it not for the Young Educator's Network, I would not have connected with them. In addition, as the youngest members of the organization, we hold the future of it in our hands. We hold the future of education and technology integration in our hands. It is up to us to build the future that we want and to ensure that the best practices that we know and share continue while also fostering innovation and global collaboration. The Young Educator's Network creates a community for us to connect and collaborate. I do find, however, that even within the Young Educator's community there is a range of experiences and associations. It was easy for us award winners to connect since we were already connected through Twitter or common colleagues. This makes me start to take the title of Emerging Leader more seriously--even if it is a label tacked on by ISTE. I do suddenly feel charged with the duty of moving best practices in technology integration and global collaboration forward. ISTE has provided a network that Twitter, the blogosphere and Ning communities can't always build since not all educators my age are as entrenched in these online communities as I am. So for those young educators out there, let's take the bull by the horns and stay connected. It is up to us to decide what the future will hold for our students and our profession. 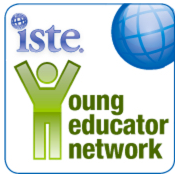 Please stop by Julie's blog about Young Educators at ISTE here.